Designed for LCD Monitors with 1440 resolution. "The Perfect Friend of the Heart of Jesus"
During a period of her life in which she was discredited and distressed, Saint Margaret Mary received this promise from Jesus: "I will send you My faithful servant and perfect friend." What an eloquent Divine testimony in favor of Father Claude de La Colombière, the Jesuit priest who became the confidant of Saint Margaret Mary and the first person to spread the message of Paray-le-Monial. His story is inseparable from that of the holy Visitation nun. Saint Margaret Mary was the one who received the requests of the Heart of Jesus; but it is because Claude de La Colombière helped her understood the value of the Message, and submitted entirely to the will of God at the cost of immense sacrifices, that the devotion to the Heart of Jesus was able to develop for the greater good of Christendom. ON February 2, 1675, in Lyons, France, following. 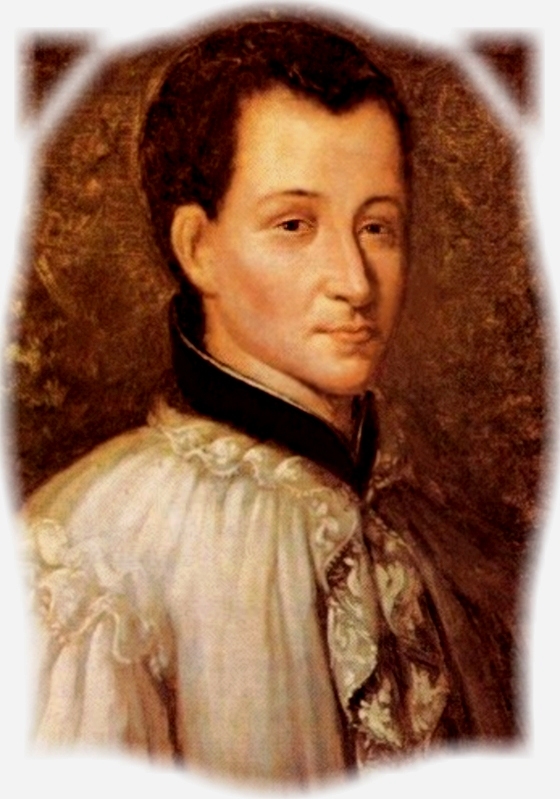 a thirty-day retreat, Claude de La Colombière made his solemn vows. It was his thirty-fourth birthday. He did not know that he had only seven years to live when obedience sent him to Paray-le-Monial, where he was to be the rector of a small college, superior of the Jesuit community and extraordinary confessor of the Visitation nuns, where he would meet Saint Margaret Mary. She had been a nun for only four years, and Jesus had already manifested Himself to her several times in extraordinary fashion. Much indeed could be said about the meeting and the spiritual journeys of these two Saints. In this article, however, we desire above all to acquaint our readers with the soul of Father de La Colombière by means of his Letters, his Spiritual Diary, his Retreat Notes and his Sermons. Father de La Colombière was influenced by the spiritual current of the French school. He had a perfect knowledge of the work of Saint Francis de Sales which had familiarized him, so to speak, with the Heart of Jesus. Meditating on the Passion and on "the patience of the suffering Jesus," he finds in the Divine Heart the perfect school for souls. During his ministry in England, on the eve of All Saints' Day in 1678, when a persecution against priests was looming, Father received a nighttime visitor, a Franciscan by the name of Father Wall. "Father, I am a poor Friar Minor who comes seeking the strength and counsel of the Heart of Jesus from you; for everywhere in this country it is known that you are its apostle." Father Claude replied, "No one can penetrate into the mysteries of that Heart without tasting the cup of bitterness that Jesus drank from so deeply at Gethsemane. Oh, if only I too could win the precious grace that your English priests are reaping in this 'land of crosses'!" I had previously heard about the famous Jesuit. When I was in his presence, I felt that I was speaking with Saint John the Evangelist who had come back to earth to rekindle Divine love with the fire of the Heart of Jesus. I felt that his attitude was totally the same as what the Apostle's must have been at the foot of the Cross, when the lance pierced his Master's side and revealed the tabernacle of His burning charity. Father de La Colombière was indeed animated with the sentiments of Saint John, and he realized how necessary purity of heart is to unite oneself to God. The blue crest with three white doves of the de La Colombière family bore the motto "SANS RESERVE." Following the call that came to him from the Heart of God, Father de La Colombière decided to respond in a way that was "without reserve." Sanctity is beyond human strength, but those who pursue this goal with determination can always be certain of having the grace of God. This declaration by Father Claude is found both at the beginning and end of his Third Year Retreat. The offering without reserve is accomplished with time. The more progress a person makes, the longer he reckons the road still to be taken. The more knowledge I acquire, the more convinced I am that it is a great misfortune for us to amuse ourselves with anything that might please us here on earth, while we are able to use our time and our mind to sanctify ourselves by the practice of humility and total self-detachment. Self-forgetfulness is very close to the spirit of childhood so dear to Saint Therese of Lisieux. We are attached to many things and are very often unaware of it. Father de La Colombière never composed a treatise on prayer, but his correspondence and retreats abound in exhortations to have intimate conversations with God. Aridity and involuntary distractions often make prayer very mortifying, but then it is all the more pleasing to God. What a great illusion -----yet it is such a common one-----to imagine that we have little or great virtue according to our few or many distractions in prayer. I have known nuns who were elevated to a very high degree of contemplation and were often distracted in their prayer from start to finish . . . Even if you were ravished in ecstasy twenty-four times a day and I had twenty-four distractions while saying one Hail Mary, if I were as humble and mortified as you, I would not exchange my involuntary distractions for all your ecstasies devoid of merit. In a word, I do not know of any devotion in which there is no mortification. Do perpetual violence to yourself, especially interiorly, and never let your nature be the master or let your heart attach itself to anything, no matter what it may be. "Learn from Me, for I am meek and humble of Heart," [St. Matthew 11:29] said Jesus in the Gospel. It is therefore by contemplating Him that we can learn true humility. The humble soul is never satisfied with itself; it always seeks to do more for God. The person who is humble of heart does not dwell on his neighbor's faults. Meditation on the betrayal of Judas alerted Father Claude to the dangers of human weakness and frailty. The humble man does not seek the approval of mortals. He tries instead to please God, and to this end he applies himself to living in His presence.